Bored with the usual suspects? Got a thirst for more nifty nature knowledge and a love of the unknown underdog? 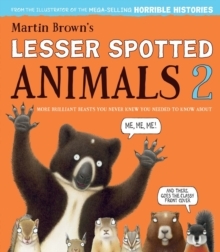 Then LESSER SPOTTED ANIMALS 2 is the book for you! Discover more brilliant beasts you never knew you needed to know about from the altai argali to the yellow-throated marten and everything in between. From the illustrator of the mega-selling Horrible Histories comes a brand new series about all the animals you've never seen.